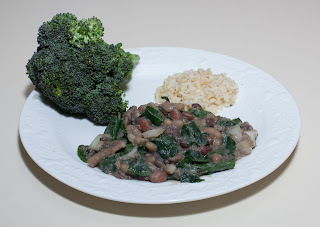 I had soaked three kinds of beans to make a main course, but I hadn't decided what the dish would be. At the coop today, they had organic cauliflower on clearance. I like how cauliflower cooks down quickly under pressure and can form a thick gravy-like matrix for other ingredients. Though only a few minutes would be needed, I thought I'd cook the cauliflower along with the beans for 25 minutes. Here is what I did. I put the beans, cumin, garam masala, turmeric, water, mushroom (the only reason I used mushroom as it was also on clearance at the store), and cauliflower into my Instant Pot pressure cooker and cooked for 25m. We had some broccoli that had to be used up, so I served a large "tree" on the side, hence the "cruciferous" title to the meal, since both broccoli and cauliflower were used. Dinner was good but needed some tweaking. Initially, it was a bit soupy, but the kale (actually, I just added the kale when I came home, so her serving didn't have it) brought it together and cooked enough in the remaining heat to satisfy. It also was a bit bland, but the salt and, at the table, hot sauce, brought it alive. I was surprised that the cauliflower didn't totally turn into a mushy backdrop. I guess that cauliflower pressure cooks down quickly in a few minutes and doesn't soften further. That was fine but worth noting. If I do want a softer cauliflower, I need to remember in the future to gently press down or even blend before serving. I should explore more multi-bean dishes and come up with more ways to get the meal to shine, such as maybe using caramelized onion, capers, or maybe olives. I was busy pruning roses and it became late, so I wanted to put a quick dinner together. 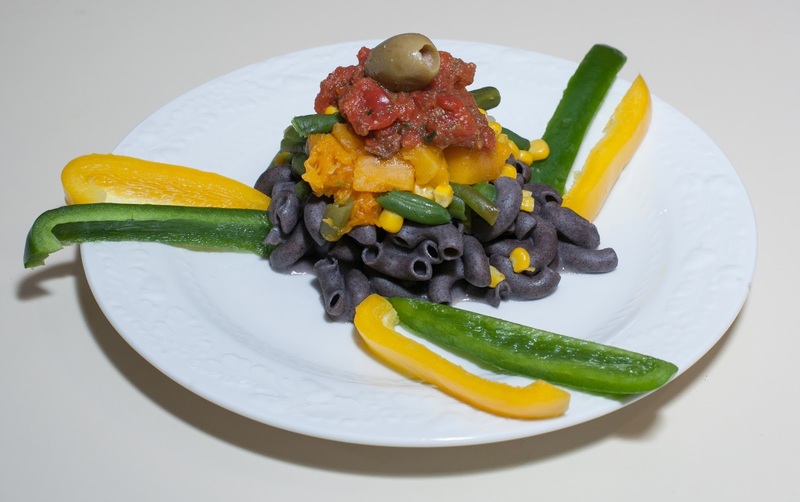 I had some interesting black bean pasta elbows from Ancient Harvest brand (the pasta's ingredients are black bean flour, brown rice flour, and organic quinoa flour). I thought I'd put together a Three Sisters meal with corn, climbing beans, and squash. I used frozen vegetables - a full bag (10 ounces) of butternut squash cubes (maybe 3/4" cubes), 8 ounces cut green beans (maybe 3/4" lengths), and 2 ounces of corn. I put in maybe 1/4 cup onion cut into 1/2" or so cubes first, and then the squash, then the bean, and finally the corn into a large Saladmaster stock pan. I cooked waterlessly - i.e., I covered the pan and heated it on medium high until the vapor release started jiggling, then I reduced the heat to low till the jiggle stopped. I let it cook for about 20 minutes. I served the vegetables atop the pasta, and put a little marinara sauce with basil, as well as an olive, on top. Dinner was good, though I think it could have had more flavor. The pasta was good, though my daughter didn't like it and found it bitter. I should try more stacked pasta dishes. More seasoning including garlic (which I was out of) and oregano (fresh oregano is now returning to my herb garden! ), as well as capers, would be good. I wonder what a pasta and polenta dish might be like? Brussels Sprouts were on sale at the cooperative grocery store today, so I decided to try roasting them similarly to what I did for the Valentine's Day dinner. I also included a golden beet, cut into 3/8" cubes. At 450°F, I oven roasted the beet with onion for about 30 minutes and the Brussels Sprouts with onion for about 15 minutes. I did not broil, but removed from the oven; the beet looked and tasted good, so I just sautéed on cast iron the Brussels Sprouts and onion, along with (for my wife and me) tempeh, bell pepper, more onion, and chopped spinach. I added a bit of salt and garlic powder when I served. For my daughter, who doesn't like spinach or tempeh, I left out the spinach and used tofu instead of tempeh. I also made a tasty tomato salad. I gave my daughter some tasty organic grape tomatoes that we also bought today. For my wife and me, I halved tomatoes, and mixed in chopped green chili pepper, ume plum vinegar, Indian black salt (kala namak), and freshly ground black pepper. I served brown rice, as well. Dinner was good but the main course wasn't as flavorful as the Valentine's Day one. I thought that the tempeh didn't work as well with this dish as the tofu. I cooked oil-free, as I almost always do; a crispier tempeh may have been better. I am so glad that it's so easy to get roasted and crispy Brussels sprouts without oil, but I should season with more spices like turmeric, lemon pepper (which I'm out of right now), and/or ground cumin, and with other ingredients like garlic or, like I did on Valentine's Day, tomato. I should experiment with it more, perhaps mixing the cooked sprouts into mashed sweet potato. Roasting other vegetable combinations would also be good. We have a Lebanese restaurant in the area, Neomonde, whose seeded pita pockets I like. 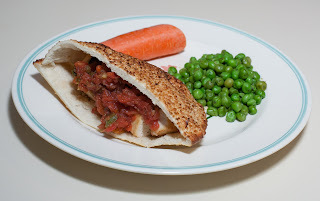 I picked some up yesterday and decided to make a simple sauteed tofu and vegetable dish served in the pita. I sauteed with no added oil on a cast iron pan and, since tofu bothers my wife, made an equivalent dish for her with tempeh instead of tofu. I also made some peas with basil. All I did was put 2 cups or so of frozen peas in a small Saladmaster stock pan along with 2t frozen chopped basil, and waterlessly cooked for about 10-15m. Dinner was simple but good. My daughter had a girl her age visiting for the evening - she had never had tofu in her life, but enjoyed the meal. Peas and basil makes a good combination! I don't generally serve or eat sandwiches for dinner, but a pocket sandwich somehow sounds appealing. I should serve these periodically and experiment with a variety of interesting fillings. I was thinking of making use of the rest of the cashew "cheese" sauce that I had made two days ago to top on some baked potatoes and vegetables. I found small (maybe 3" x 2" oblong) baking potatoes in the store, so thought that I would pressure steam them for 10m and serve with broccoli and bell pepper. (My daughter much prefers sweet potatoes, so I served her sweet potatoes instead of baking potatoes.) I cooked waterlessly onion, bell pepper, and broccoli. I served the potatoes topped with the other vegetables and a bit of the "cheese" sauce (this time I used even less sauce and so feel justified in describing this meal as being cooked with almost no added fat; it was about a tablespoon and a tablespoon of cashews is about 6g of fat, but the sauce had water and other ingredients, so perhaps I added 3-4g of fat or so?). I also wanted to use up the drying bread that I had. I've made Italian bread salad (panzanella) with oil on bread cubes roasted in an oven, but wanted to make this without oil. I cut up bread into maybe 3/4" squares and maybe 3/8" thick and put them on a plate as a single layer. I baked at 400°F for 10 minutes in a toaster oven. In the meantime, I mixed up some cucumber and tomato cubes (about 5/8" each), 1/2 t balsamic vinegar, 1t capers, maybe half a dozen Kalamata olives cut into thirds, 1/4 t dried oregano, and 1/8 t freshly ground black pepper. I mixed the croutons in and served. Dinner was good - everybody enjoyed it. I was surprised that the panzanella came out as well as it did; it does taste better with olive oil, but my version today was still tasty! 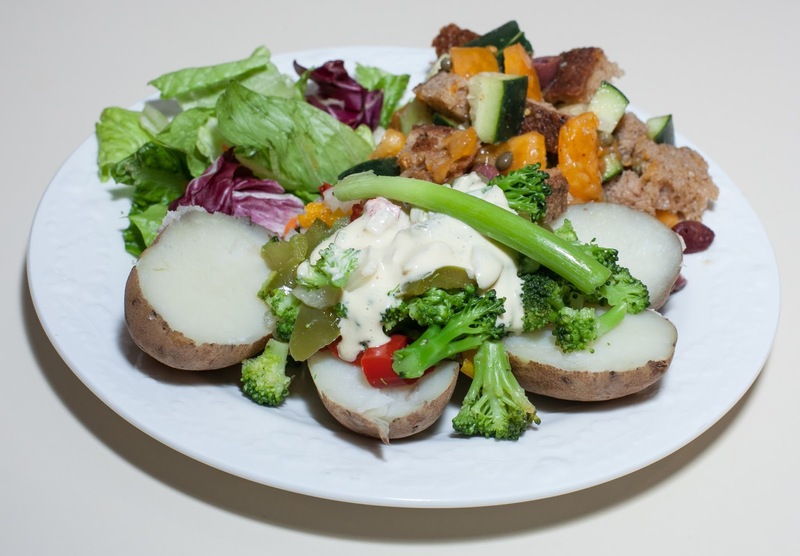 I should try more dishes with potatoes or sweet potatoes topped with vegetables and experiment with "cheese" and other sauces. My daughter had a young friend over to join us for dinner tonight. I had soaked some chickpeas last night, wanting to make a chickpea main course. I decided that it's been too long since I've made and used a "cheese" sauce, such as I described in July 2011 with an Alfredo sauce or the Food for Life sauce that I made, for example, in January 2015 and April 2014. I decided to make a simple cheesy chickpea dish. Here is what I did. I cooked the chickpeas, covering with water, in my Instant Pot pressure cooker for 25m. I could have waited a short while, then gently released remaining pressure and opened the Instant Pot, but I planned ahead and had the chickpeas done earlier so, when I was ready, I just opened the pot. In the meantime, I made my cashew cheese sauce. 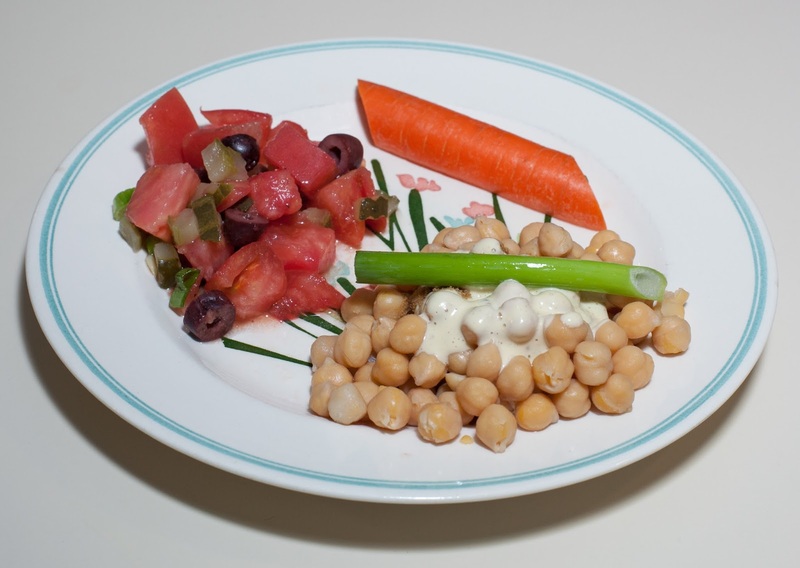 I did as I described in 2011, as below, and served a tablespoonful or so atop the chickpeas. I also made a salad with chopped tomato, olive, scallion, and dill pickle, along with some lime juice, salt, and black pepper. We had some crusty bread and my wife had suggested a bread salad, but our dinner guest was gluten-free, so I didn't add bread cubes. Dinner was good! All of us enjoyed the meal. I don't use a "cheese" sauce often but, when I do, it's always nice. I was going to describe this dish as "almost no added fat". Cashews have 12g of fat per ounce; in the Food for Life program that I teach, we recommend 10% fat calories, or, as a rough guide, about 3g of fat per serving of a dish. We used up only about 50-60% of the sauce, and that spread among the four diners. One cup is eight ounces, so each serving then had about 50% of (12g of fat/ounce x 8 ounces/cup / 4 servings) = 50% of 24 g of fat/serving, or about 12g of fat. That's not insignificant, so I'll omit the description. I could make this an "almost no added fat" dinner by being very modest with the sauce. However, the fat isn't excessive and I think the quantity of sauce I used balanced the chickpeas well. If I didn't rely on the one-ingredient base and had other ingredients, such as perhaps raw bell pepper chunks, peas, carrots, and/or zucchini, I bet less "cheese" would be just fine. Beyond the fat issue, the main course would have been more interesting with additional ingredients. I was planning on mixing in some chopped kale, but our visitor tonight doesn't like kale and I didn't have any other greens. We just returned from a lovely trip to British Columbia. We loved visiting places like Victoria and Vancouver. We spent the first and last nights of our vacation in Seattle and, last night, had a particularly memorable dinner at what I was told may be the best vegan restaurant in town, Harvest Beat. I'll include, as a postscript, some notes on vegan dining that we found on our trip. I got to making dinner almost immediately after returning from the airport. I found a few vegetables (fennel, carrot, bok choy, as well as longer-lasting onion and garlic) in the refrigerator, as well as, alas, some kale that was no longer good enough to use. I had frozen black-eyed peas but, unfortunately, no frozen greens. But I had enough to put together a tasty and healthful meal. 1 1/2 cups roasted bell pepper cut into strips approx. 1/2" x 1 1/2"
I put, in this order, the onion, garlic, fennel, carrot, bell pepper, and black-eyed peas into a large Saladmaster stock pan. I then mixed in the bok choy, spices, salt, and lemon juice, and served with brown rice (which I cooked simmered 45-50m stovetop with twice as much water as rice, as well as a pinch of salt and a no added salt vegan bouillon cube) and salad. My family enjoyed the meal. I liked it, but thought that it could have been more pronounced in flavor. Greens would have been good in this dish. I could have used more garlic or even roasted garlic. Perhaps lemon pepper would have been good. It was easy to find good vegan food on our trip. Seattle, Victoria, and Vancouver have many vegan restaurants! We took the Clipper Ferry from Seattle to Vancouver Island. Vancouver Island is a huge almost 300-mile-long island on the westernmost part of Canada and dipping to the country's southernmost point. The big city of Vancouver is also part of coastal British Columbia, and separated by an hour and a half or so ferry from Vancouver Island. We spent the first few days of our trip in Victoria. It's a beautiful and small town of under 100,000 people. 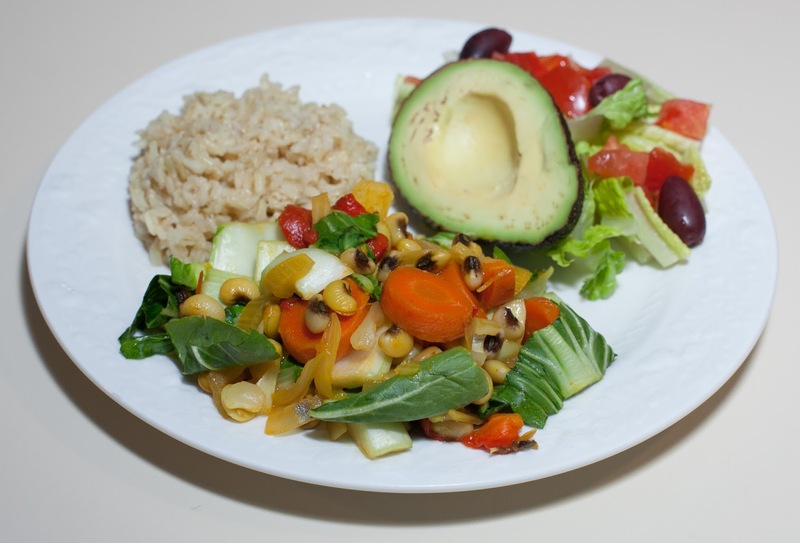 It has a number of all-vegan restaurants and is fairly vegetarian and vegan friendly. There is a Whole Foods Market that opened just a few months ago in November 2016; we didn't have time to see if there are food coops or what their other grocery stores are like. Green Cuisine Vegetarian Restaurant was our first dinner stop on Victoria. It's an all-vegan buffet with many choices of good food. We loved the environment, good food, and reasonable prices. We had lunch with some local vegans at a new "vegan butcher" shop that opened less than a month ago, The Very Good Butchers. The food, featuring burgers, macaroni and "cheese", and other items, was all organic and vegan, and was good and filling. We had a dinner at Be Love, an almost all-vegan restaurant with an inviting meditative ambiance and tasty food. I had a simple bowl of sides, reminding me of what I might serve at home - I think I had tempeh, greens, and brown rice. I missed the opportunity to try their veganized (with cashew "cheese") Canadian specialty of poutine, traditionally French fries and cheese with gravy. I had also heard about quite a few other good restaurants, such as Bliss, Lotus Pond (vegan Buddhist with mock meats), and Rawthentic, and Jusu Juice Bar. Vegan Hippie Chick Cafe is a new organic and vegan restaurant that is supposed to soon open. There is a branch of Power House Living Foods here; we enjoyed eating at Power House in Nanaimo, north of Victoria. We stumbled on a great find, Pure Lovin' Chocolate. Operated by a mother and daughter team, it's an organic, fair-trade, vegan, soy- and gluten- free handcrafted chocolate boutique. We then spent a few days about an hour and a half north at another town of under 100,000, Nanaimo. I believe it is the major port for bringing in materials to the island, and is a major ferry port for the mainland (we traveled the 1 1/2 hour ferry to Vancouver). It has a culinary claim to fame for the Nanaimo Bar; I bet that a vegan version is available, perhaps at Power House Living Foods, and wish that I had looked. We loved having lunch at raw, vegan, organic Power House Living Foods. Their serving sizes (even their half portions) were large and the presentation was gorgeous, rivaling or possibly exceeding our own very nice local Living Kitchen. Unfortunately, we didn't find the town otherwise very appealing from a food perspective. There was a wide variety of restaurants and, no doubt, most could probably serve a reasonable vegan meal. We did find a pizzeria we liked, Mambo Pizza. Rather nondescript and small with seating for maybe a dozen, it appears to be mainly a take-out restaurant. I find pizzerias that use good ingredients and have good dough often make satisfying pizzas without cheese. That was the case here; the crust was particularly good and reasonably crispy, the sauce was good, and the ingredients fresh. They are accommodating of vegans and offer gluten-free pizzas, as well - they offer, at no extra charge, vegan Daiya brand "cheese". My wife found at Whole Foods, both in Victoria and later in Vancouver, a fabulous fig and anise bread from a company called Terra Breads. The sourdough was a great matrix for the fig and just strong enough anise; I sure wish that this were available in North Carolina. The bread had great flavor and needed no topping - it was great at room temperature or lightly toasted. The Victoria Whole Foods had choices of how thick to have the loaves sliced; I enjoyed a 5/8" thicker slice. I hope soon to add more information about the many vegan choices in Vancouver and our final dinner on the trip, a unique five-course vegan meal in Seattle. I made a simple waterless dish by cooking in a large Saladmaster stock pan onion, garlic, quartered Brussels Sprouts, and most of a bunch of Swiss chard for about 20m. I served with sweet potato and black beans cooked in my Instant Pot. After cooking, I mixed into the beans onion, marinara sauce, fresh Meyer lemon juice, ground cumin, and salt. I wanted to use a remaining green tomato from the farmers' market from this past weekend. I thought I'd make a thick split pea dhal featuring the tomato. Here is what I did. Split peas typically take 8-10m of pressure cooking in a ratio of 1 part split peas to 3 parts water. I wanted a thicker dhal, so went with a 1:2.5 ratio for 10 minutes. I put the split peas, water, green tomato, turmeric, and cumin into my Instant Pot pressure cooker and cooked for 10m. After the cooking was done, I waited a few minutes and gently released pressure, then mixed in the salt and lime juice.